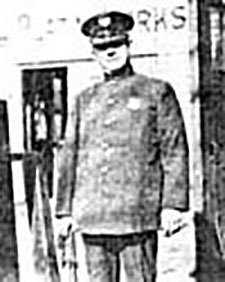 Officer Otto Ziska joined the Cleveland Police Department on August 16, 1918 and was assigned to the 5th Precinct. He had previously served with the city park police force. On October 1, 1922 he was reassigned to 5th Emergency Squad. On May 15, 1929 his squad received a call to respond to the Cleveland Clinic for an explosion and fire with numerous dead and injured. As the police and firefighters arrived on the scene, they observed billowing smoke, and flames raging from the basement windows of one of the Clinic buildings. Patrolman Ziska immediately entered the building and began assisting doctors, nurses and patients out of the inferno. Ptl. Ziska was credited with saving the lives of numerous citizens during this disaster. As a result of his efforts that day Ptl. Ziska battled the remainder of his life with chronic lung problems and serious illnesses which hospitalized him on numerous occasions. After suffering over a decade with these health problems, Ptl. Ziska succumbed to his injuries on March 31, 1940. Ptl. Ziska was survived by his wife, Catherine, daughter Magdalene, and sons; Adolph, Raymond, and John. Ptl. Ziska was a member of the Masonic Order. Otto J. Ziska’s name is inscribed on the National Law Enforcement Officers Memorial Wall in Washington D.C. Panel 49, E -23.